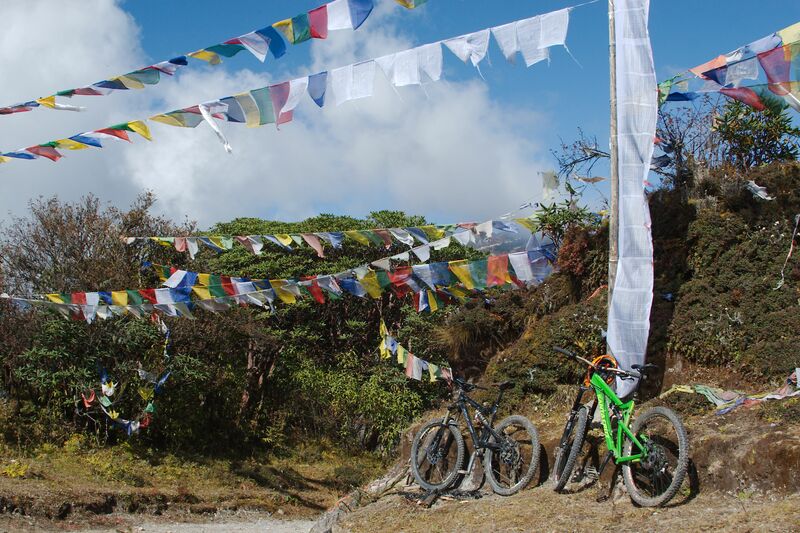 If you have not read part 1 of Sean's Himalayan trip you'll want to do that first. Clicky here. In this particular part of the world, sunrise is a ritual that has to be experienced. 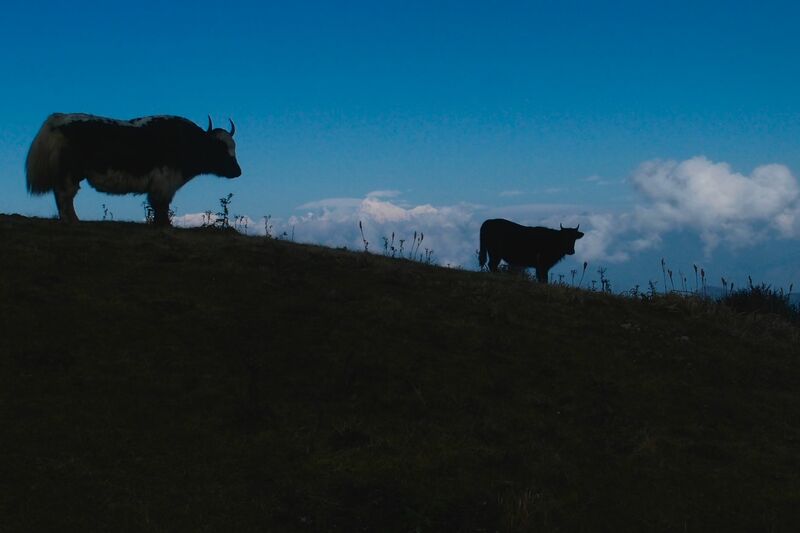 In the pre-dawn I wandered out onto a nearby vantage point and took in the view of the Himalayan massif stretched out, from Kanchenjunga immediately in front to Everest to the East and beyond. In the half light it was, lets just say pretty awesome. Slowly the sun appeared, and then hit the peaks in height order, lighting up each in a bright orange flare. The whole experience is pretty overwhelming, we stayed again a few days later and experienced it again –words and pictures cannot do this justice. After a few days of cloud and rain, it was a relief to wake to clear skys, the only metaphorical cloud was a chest infection I’d picked up – I hedged my bets and took a good selection of antibiotics. Considering the drop to our night stop, we still hadn’t dropped an inch – which meant that things could only go one way, down. We’ve all got a favourite trail, and we’ve all had one of those days where everything comes together and you ride like a trail god. Today was one of those days where both come together. Checking in at an Army checkpost (they dot the border with Nepal, and as we’d crossed over, passports needed to get back!) and then tea and mo mo’s in a Sherpa hut gave us a chance to rest and check out the trail ahead. Starting above the treeline, we would be following a trail down into the forest and around 11km and 1800m lower our stop for the night. 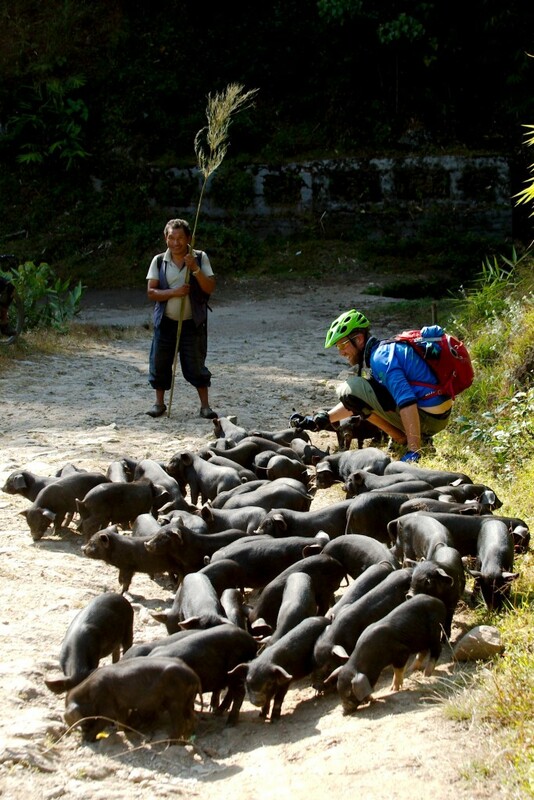 I’ll say this again – an 11km singletrack descent. There’s a way to ride virgin trails, flat out! Slow down and you hit every root and rock, get to the right speed and you glide over. The mental toll of this type of riding is perhaps more than the physical (we were riding blind, so had to be super focused on every turn and drop) , so we quickly adopted a system where the faster of us swapped the lead every couple of minutes, that way we kept it pinned, and barring a flat or two we kept a quick pace to the bottom. And what a trail! Doubt it had ever seen a tyre, but centuries (or millennia) of feet and hooves had done a good job of sculpting an amazing trail. Stop for the night was a village called Gorkhy. It’s nice to know places like this exist, cut off from the outside world (everything is carried in on donkeys or sherpas), life probably hasn’t changed much here for centuries. Incredibly peaceful, the villagers were really friendly and open, and as we’d dropped down, it had oxygen! Just as well, the few days previous and chest infection had really taken its toll on me, so food and a good night’s sleep was exactly what I needed. Ever since arriving in India, the thought of breaking myself has nagged away, after all I don’t think I’ve been on a trip abroad without someone breaking something, and given what we were riding this was a constant nag. As our overnight stop was so remote, conversation over dinner turned to what we’d do if it went pear shaped. Only one option as it turns out, Mike admitted he’d been in this position a couple of years back, one of his party had broken a leg, so he was strapped to the back of a donkey… for two days! Never mind the pain, If you had smelt a donkey, and witnessed how suicidal they appear, you would appreciate this would not be a pleasant experience. From then on, a cry of ‘donkey speed’ meant let the brakes off and go for it! Throughout our trip Kanchenjunga was a constant companion, the third highest mountain in the world (8586m), known locally as the sleeping budda (see the pic at the top). 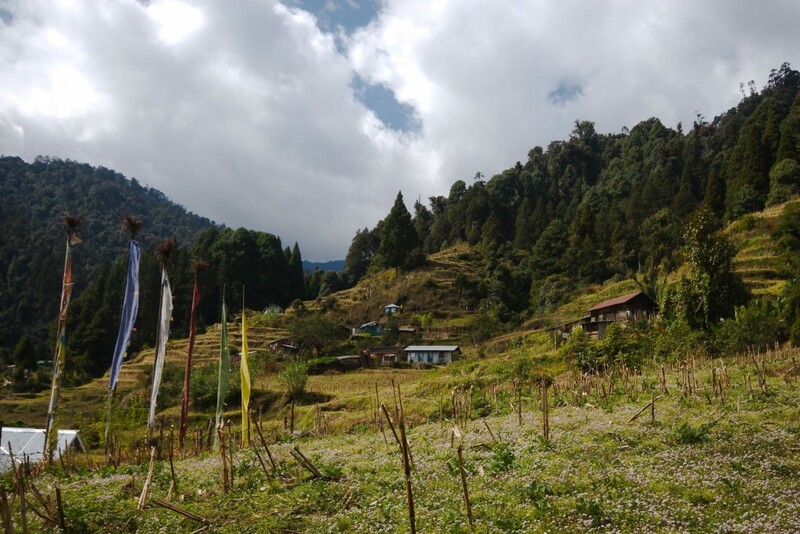 Our night stop was on the border of Sikkim, until 1975 an independent state, now the 22nd state of India, and home to Kanchenjunga. Continuing the Brits tradition in these parts, Joe Brown & George Band claimed the first ascent in 1955. They never actually made it to the summit, as promised to the Chogyal (king) of Sikkim, they’d not set foot there as it’s sacred. In this age of one-up manship and ticking off firsts, it’s nice to know that every climber since has held to this promise, and the summit remains un-trodden. 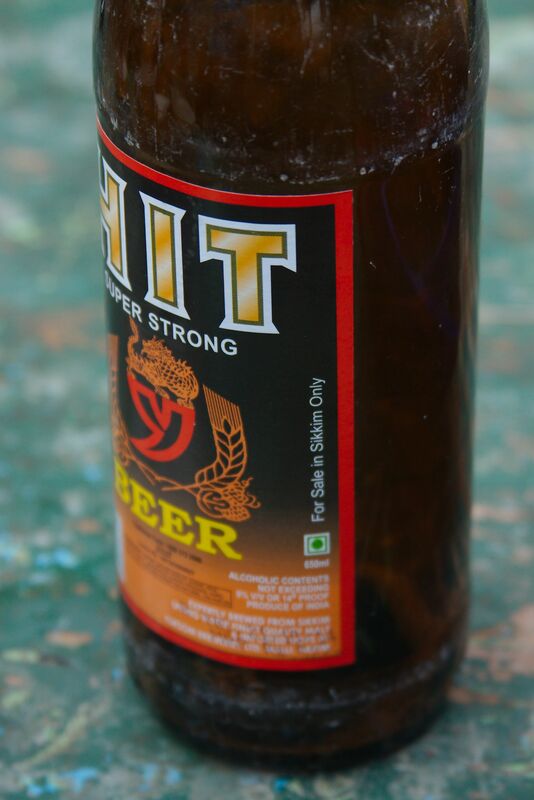 The other more pertinent fact about Sikkim, it’s kept separate laws on Alcohol, which meant cheaper booze was available there, and with the porous border, everywhere we went (as displayed on beer labels). Considering the amount of riding we’d done in the past week, today was going to be an easy day – following a trail through the forest our next stop for the day would be around the same altitude as Gorkhy. With an actual night’s sleep and a lazy start, I properly enjoyed every bit of trail, a ‘tough tech fest’ is how a mtb magazine would probably describe the riding – given the short day we had time to check bits of trail out, lots of chin stroking ‘will it go’, continuing my heroics the previous day I can honestly say I rode everything, and have witnesses, so there! We had Ramman back up to Sandakphu pegged as a toughie, and tough it was. In fact I don’t think I’ve ever been so utterly destroyed – read somewhere that the mind has no capacity to remember pain (you can remember being in pain, but not recall the actual sensation). Looking at the photo of me below, I’d argue otherwise, just thinking about how I felt sat there makes me feel sick. The trail back up to the ridge line was a steep carry (a 150mm burly all mountain bike is exactly the right bike to ride, not carry). No point in going into detail, it was horrible. From the top (where I was sat), we rode back along the old trail to Sandakphu – I was so tired I blanked this bit out, except counting down the km marker rocks. It was getting decidedly dusky by the time we rolled one by one back into the Sherpa station, and rest. 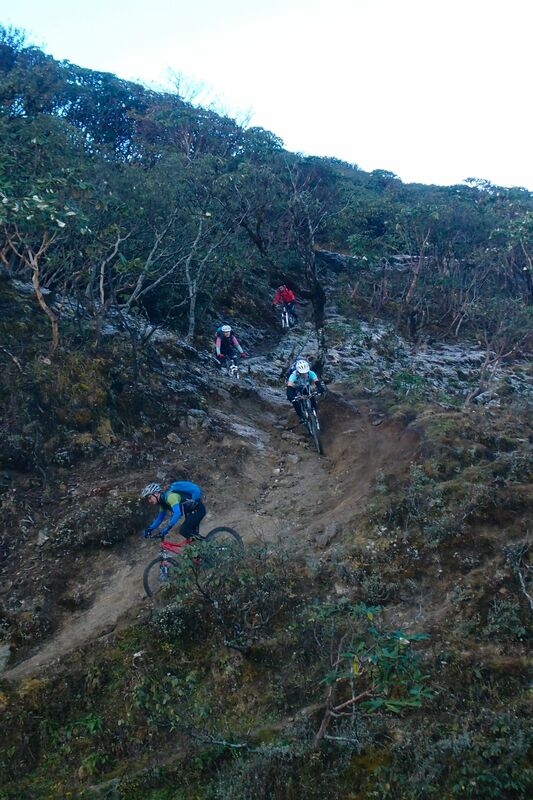 Good thing about being in Sandakphu, the next couple of days would take us progressively* down. First up a big day to Darjeeling (and by now, hopefully you’ll realise, big means BIG). Straight out of the Sherpa hut we dropped down into Nepal, never a great idea to start with a downhill, a slide at the top and I nearly went over the edge, so a bit more caution until warmed up! **showers, and the kit we dumped… my solitary pair of pants had served well, but after 5 days a change was probably in order! 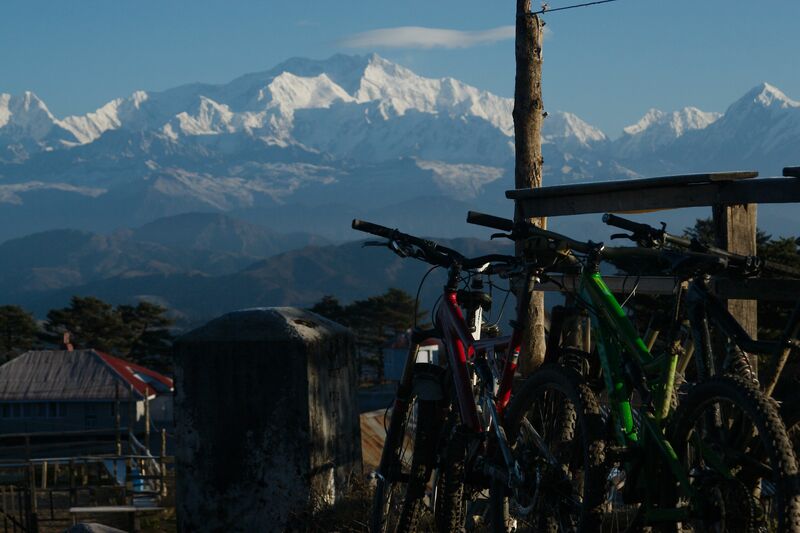 Final days riding was from Darjeeling to Silguri, yup another biggie! On that first day in Kurseong I gazed down onto a river on the Bengal plain, that’s where we were aiming for today. Darjeeling is at 2200m the river near as dam it sea level, what ever happens, we’d re-balance the downhill account! A biking trip abroad is always a treat, I’ve been on a number around Europe, the difference here is the experience as a whole. There wasn’t a distinction between the riding and the not riding, we’d been immersed in the whole experience. Only worry is the usual week in the Alps doesn’t feel quite the thing it once was, but the map of riding potential suddenly got a whole load bigger. *a long time, 10 years if I was careful!